With a 40-year limited paint system warranty, the ABC Signature® 200 offering represents one of the most sophisticated siliconized, modified polyester (SMP) paint coating and warranty protection products in the industry. But do you understand what it means to have a 40-year warranty? To comprehend your coverage options, you first need to know what a “40-Year Warranty” means in the industry. This limited warranty covers the film integrity of the paint system used on your wall and roof panels in case of cracking, checking and peeling for a period of 40 years. Most manufacturers of metal roofing have this basic warranty available, however—as with any warranty—the most miniscule details can impact the overall effectiveness and value. What are the limitations of the warranty? What are the financial implications of not abiding by the warranty? The answers to these questions and additional coverage information should be readily available and provided to you by the supplier. Keep in mind that all 40-year warranties—while generally similar—are not equal; it’s essential to thoroughly investigate the product’s warranty details to ensure the best property protection is received. 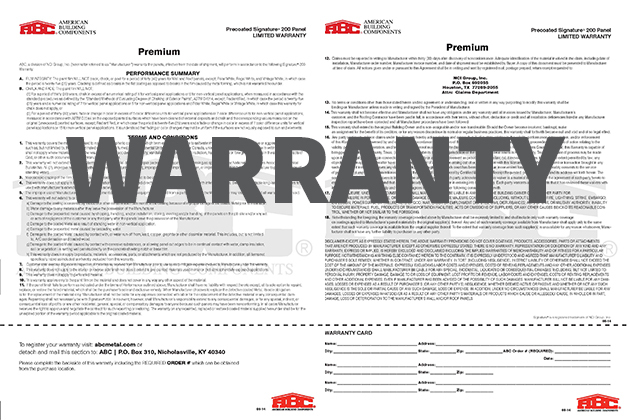 We encourage you to view ABC’s warranties on our website. You can also learn more about the proper handling of ABC’s metal panels by reading the product installation manuals. The precautions in the manuals can help save time, heartache and, of course, money. How well paint adheres to the substrate is not the only concern for many metal wall and roof panel consumers; homeowners often ask us about the fading of the paint system and the factors that should be considered when purchasing. In the next installment of our “Decoding Your Warranty” blog, we will discuss fading in more detail and provide insight into this commonly overlooked factor in warranties. Nice piece on the details of a warranty. Keep up the good work.